Crush 5-gallon steel pails quickly and easily with this Steel Hydraulic Pail Crusher. 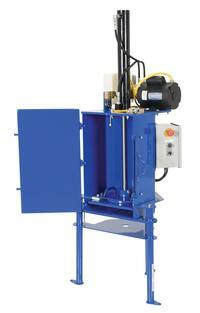 The model V-HPC-400 crushes steel pails to approximately 2" high and resets automatically to crush another pail. Reduce pail storage space and disposal costs Safety features include: pressure relief valve to prevent overload, door interlock system to prevent the motor from running if the door is unlatched, 10,000 pounds of crushing power, hydraulic pump provides 70 second cycle time, mushroom head emergency stop button, relief valve to prevent hydraulic system overload, removable legs for bench top mounting and 120 volt single phase for "plug in operation". Meets OSHA and JIC standards.